This article is about the specific effects of meditation on the human brain. For general information about meditation, see Meditation. For research on meditation, see Research on meditation. 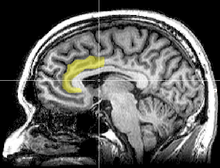 Highlighted region shows the anterior cingulate cortex, a region of the brain shown to be activated during meditation. Mindfulness meditation is frequently studied, a Buddhist meditation approach found in Zen and Vipassana. Jon Kabat-Zinn describes mindfulness meditation as a complete, unbiased attention to the current moment. Electroencephalography (EEG) has been used in many studies as a primary method for evaluating the meditating brain. Electroencephalography uses electrical leads placed all over the scalp to measure the collective electrical activity of the cerebral cortex. Specifically, EEG measures the electric fields of large groups of neurons. EEG has the benefit of excellent temporal resolution and is able to measure aggregate activity of portions or the entire cortex down to the millisecond scale. Unlike other imaging based methods, EEG does not have good spatial resolution and is more appropriately used to evaluate the running spontaneous activity of the cortex. This spontaneous activity is classified into four main classifications based on the frequency of the activity, ranging from low frequency delta waves (< 4 Hz) commonly found during sleep to beta waves (13–30 Hz) associated with an awake and alert brain. In between these two extremes are theta waves (4–8 Hz) and alpha waves (8–12 Hz). Many studies on mindfulness meditation, assessed in a review by Cahn and Polich in 2006, have linked lower frequency alpha waves, as well as theta waves, to meditation. Much older studies report more specific findings, such as decreased alpha blocking and increased frontal lobe specific theta activity. Alpha blocking is a phenomenon where the active brain, normally presenting beta wave activity, cannot as easily switch to alpha wave activity often involved in memory recall. These findings would suggest that in a meditative state a person is more relaxed but maintains a sharp awareness. Two large, recent comprehensive review works, however, point to poor control and statistical analyses in these early studies and comment that it can only be said with confidence that increased alpha and theta wave activity exists. A statue of Buddha meditating. As a relatively new technology, fMRI has only recently been used to assess brain state changes during meditation. Recent studies have shown heightened activity in the anterior cingulate cortex, frontal cortex, and prefrontal cortex, specifically in the dorsal medial prefrontal area during Vipassana meditation. Similarly, the cingulate cortex and frontal cortex areas were shown to have increased activity during Zen meditation. Both studies comment on the possibility that these findings could indicate some state of heightened voluntary control over attention during mindfulness meditation. Review works by Cahn and Chiesa state that these results indicate consistency in meditation’s effect on these regions of the brain, citing a multitude of other studies spanning other meditative disciplines, but mention the need for further investigation with better controls. Similar to research into state changes in brain function, older studies make more specific claims about trait changes in meditators versus non-meditators. Changes to the alpha wave were indicated to be a trait, as well as state, phenomena. Studies have reported an increase in the specific frequencies expressed in the alpha range, increased alpha band power, and an overall slowing (reduction in frequency) in EEG activity in experienced meditators versus less experienced meditators while meditating. The alpha blocking phenomena, observed as a state change in brain function, was investigated as a possible trait change as well. One study that examined a variety of meditation techniques tried to show that alpha blocking was affected by the long term practice of meditation by testing response to auditory stimuli. Review works, however, comment on inconsistent findings as well as a lack of repeated results in this, and other studies. They further remark that, similar to observations in brain state changes, only general assertions can be made about brain trait changes: some change in the electroencephalographic profile exists but with some inconsistency. It is also important to note that these trait changes were observed during meditation, and although it does indicate that a practitioner’s electroencephalographic profile is modified by the practice of meditation, these EEG studies have not yet shown changes in non-meditating brains, even of experienced meditators. Red region of the brain shows the hippocampus which had been shown to have heightened activity during meditation by experienced meditators. There is also evidence to suggest meditation plays a protective role against the natural reduction in grey matter volume associated with aging. One study found evidence that Zen meditators experienced a slower age related decline rate for cerebral gray matter volume in the putamen which plays a role in learning, cognitive flexibility and attentional processing  This could suggest a better attentiveness in aging meditators versus non-meditators. Long-term meditation practitioners have also shown to have a higher tolerance for pain. This effect has been correlated to altered function and structure in somatosensory cortices and an increased ability to decouple regions in the brain associated with the cognitive appraisal of pain (anterior cingulate cortex and dorsolateral prefrontal cortex). In the meta-analysis performed by Fox et al., several sources of bias were indicated which bring into question the validity of meditation studies which use neuroimaging. Fox et al. suggests a publication bias may be leading to the over-reporting of significant results. Despite this, however, Fox et al. found "consistent differences in prefrontal cortex and body awareness regions" in "areas key to meta-awareness..., exteroceptive and interoceptive body awareness..., memory consolidation and reconsolidation..., self and emotion regulation..., and intra- and interhemispheric communication..." and that changes were significant with "moderate" global median effect size and "consistent and medium-sized brain structure differences." More research will be needed before any firm conclusions can be made. Besides scientific literature, some authors have written of the promising research on meditation in books targeted for general audiences. One such book, Buddha’s Brain by Rick Hanson, PhD shares the current scientific research and investigations into meditation. Hanson, a neuroscientist and researcher, explains to readers the scientific studies in plain language and discuss the impact of the results. Hanson’s main argument is that positive emotions, like love can be strengthened through meditation in a neuroplastic manner, citing dozens of scientific studies to support this claim. Hanson’s viewpoint is representative of a larger popular movement to study and embrace Eastern phenomena including meditation in the Western world. ^ Mizuno, Kogen (1972). Essentials of Buddhism. Tokyo: Kosei Publishing Company. ^ Ahir, D.C. (1999). 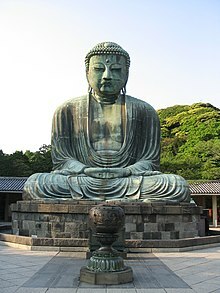 Vipassana : A Universal Buddhist Meditation Technique. New Delhi: Sri Satguru Publications. ^ Kabat-Zinn, Jon (1998). Wherever You Go, There You Are : Mindfulness Meditation in Everyday Life. New York: Hyperion. ^ a b c d Cahn BR, Polich J (2006). "Meditation states and traits : EEG, ERP, and neuroimaging studies". Psychological Bulletin. 132 (2): 180–211. doi:10.1037/0033-2909.132.2.180. PMID 16536641. ^ a b Kasamatsu KH, Hirai T (1966). "An electroencephalographic study on the zen meditation (Zazen)". Folia Psychiatrica et Neurologica Japonica. 20 (4): 315–336. doi:10.1111/j.1440-1819.1966.tb02646.x. PMID 6013341. ^ a b Chiesa A, Serretti, A (2010). "A systematic review of neurobiological and clinical features of mindfulness meditations". Psychological Medicine. 40 (8): 1239–1252. doi:10.1017/S0033291709991747. PMID 19941676. ^ Holzel BK, Ott U, Hempel H, Hackl A, Wolf K, Stark R, Vaitl D (2007). "Differential engagement of anterior cingulate and adjacent medial frontal cortex in adept meditators and non-meditators". Neuroscience Letters. 421: 16–21. doi:10.1016/j.neulet.2007.04.074. PMID 17548160. ^ Pagnoni G, Cekic M, Guo Y (2008). "' Thinking about not- thinking': neural correlates of conceptual processing during Zen meditation". PLoS ONE. 3: e3083. doi:10.1371/journal.pone.0003083. ^ a b Lutz A, Brefczynski-Lewis J, Johnstone T, Davidson RJ (2008). "Regulation of the Neural Circuitry of Emotion by Compassion Meditation: Effects of Meditative Expertise". PLoS ONE. 3 (3): e1897. doi:10.1371/journal.pone.0001897. PMC 2267490. PMID 18365029. ^ Stigsby B, Rodenberg JC, Moth HB (1981). "Electroencephalographic findings during mantra meditation (transcendental meditation). A controlled, quantitative study of experienced meditators". Electroencephalography and Clinical Neurophysiology. 51: 434–442. doi:10.1016/0013-4694(81)90107-3. ^ Becker DE, Shapiro D (1981). "Physiological responses to clicks during Zen, yoga, and TM meditation". Psychophysiology. 18: 694–699. doi:10.1111/j.1469-8986.1981.tb01846.x. ^ Andersen J (2000). "Meditation meets behavioural medicine: The story of experimental research on meditation". Journal of Consciousness Studies. 7: 17–73. ^ a b Fox, Kieran C.R. ; Nijeboer, Savannah; Dixon, Matthew L.; Floman, James L.; Ellamil, Melissa; Rumak, Samuel P.; Sedlmeier, Peter; Christoff, Kalina (June 2014). "Is meditation associated with altered brain structure? A systematic review and meta-analysis of morphometric neuroimaging in meditation practitioners". Neuroscience & Biobehavioral Reviews. 43: 48–73. doi:10.1016/j.neubiorev.2014.03.016. PMID 24705269. ^ Pagnoni G, Cekic M (2007). "Age effects on gray matter volume and attentional performance in Zen meditation". Neurobiology of Aging. 28 (10): 1623–1627. doi:10.1016/j.neurobiolaging.2007.06.008. PMID 17655980. ^ Grant, J. A.; Rainville, P. (5 January 2009). "Pain Sensitivity and Analgesic Effects of Mindful States in Zen Meditators: A Cross-Sectional Study". Psychosomatic Medicine. 71 (1): 106–114. doi:10.1097/psy.0b013e31818f52ee. ^ Grant, Joshua A.; Courtemanche, Jérôme; Rainville, Pierre (January 2011). "A non-elaborative mental stance and decoupling of executive and pain-related cortices predicts low pain sensitivity in Zen meditators". Pain. 152 (1): 150–156. doi:10.1016/j.pain.2010.10.006. PMID 21055874. ^ Jang, Joon Hwan; Jung, Wi Hoon; Kang, Do-Hyung; Byun, Min Soo; Kwon, Soo Jin; Choi, Chi-Hoon; Kwon, Jun Soo (January 2011). "Increased default mode network connectivity associated with meditation". Neuroscience Letters. 487 (3): 358–362. doi:10.1016/j.neulet.2010.10.056. PMID 21034792. ^ a b Fox, Kieran C.R. ; Nijeboer, Savannah; Dixon, Matthew L.; Floman, James L.; Ellamil, Melissa; Rumak, Samuel P.; Sedlmeier, Peter; Christoff, Kalina (2014). "Is meditation associated with altered brain structure? A systematic review and meta-analysis of morphometric neuroimaging in meditation practitioners". Neuroscience & Biobehavioral Reviews. 43: 48–73. doi:10.1016/j.neubiorev.2014.03.016. PMID 24705269. ^ a b Hanson, Rick (2009). Buddha’s Brain: The Practical Neuroscience of Happiness, Love, and Wisdom. Oakland, CA: New Harbinger Publication, INC. ISBN 978-1572246959. ^ a b c Flanagan, Owen (2011). Bodhisattva’s Brain: Buddhism Naturalized. Cambridge, MA: The MIT Press. ISBN 978-0262016049. ^ Awasthi B (2013). "Issues and perspectives in meditation research: in search for a definition". Frontiers in Psychology. 3: 613. doi:10.3389/fpsyg.2012.00613. PMC 3541715. PMID 23335908. This page was last edited on 23 December 2018, at 15:37 (UTC).